This is going to be a long post and possibly difficult to understand – especially for people not comfortable with English. I have included links to other blog posts so it is helpful to read those other posts as you read through this one. OK, I have been “studying” DV for a couple of years now – and my knowledge about the subject is mainly gained through my interactions with others, reading of the laws etc. and having access to the CEAC data (thank you Rafik!). Without looking at the full breadth of information we can only make wild guesses – rather like being put in a large pitch black room and being told there is an animal in there and being asked to guess what animal it is without turning the lights on. You can get clues and bit by bit you get the whole picture. Well yesterday USCIS gave us a flashlight. It is still a dark room, but we can see a lot more. What was the flashlight? They published the CEAC data to their website and using a computer program I have extracted all the data as a snapshot. As the year progresses I will publish updates to the data at least every month, but faster if possible as my time allows. Last year the CEAC data was useful but we only got information as the cases were scheduled. This year they have loaded a lot more data so we can “know” a lot more – or at least confirm things that I have previously described in theoretical term and explanations. The flashlight let’s us see a bit more…. 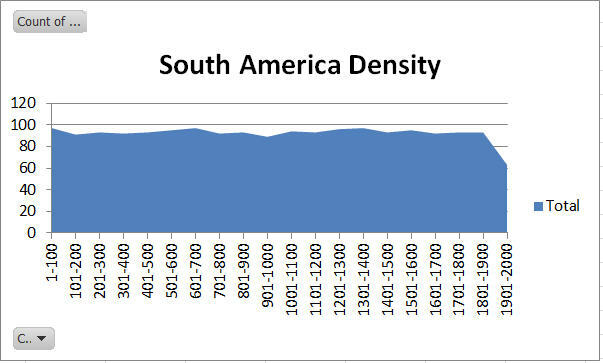 First let me show the density charts for the five main regions (I ignore North America generally because it is too small to be significant to the process). So – the disqualification holes rate for AF is just over 20% – meaning 1 in 5 cases in Africa were disqualified and never got notified that they were winners. In reality this rate would vary by country. Some countries would have almost no disqualification rate whilst others would have very high rates. The reasons for that difference are cultural (some countries have more “creativity”) and also there is an influence of unscrupulous/clumsy agents. Agents in a place like Nepal for instance are charging low fees and don’t seem to try to cheat/blackmail people, so the entries are genuine and rarely disqualified). In Ghana however, there agents are clearly using unscrupulous tactics that will cause their high refusal rates (i.e. many failures during interview), but they seem to at least be passing the initial disqualification phase better than their counterparts in Ukraine. As I have described before, the Ukrainian and Ghanaian derivative ratios are indicative of agents being involved in the process (because they will often register an applicant “proactively” without family members. In my draw process post I describe the draw process and point out that some countries are limited during the draw process. I have explained this in further detail for some of the limited countries such as Ethiopia, and Egypt. The limited countries are Ethiopia, Ghana, Egypt, Ukraine, Uzbekistan, Nepal and Iran. 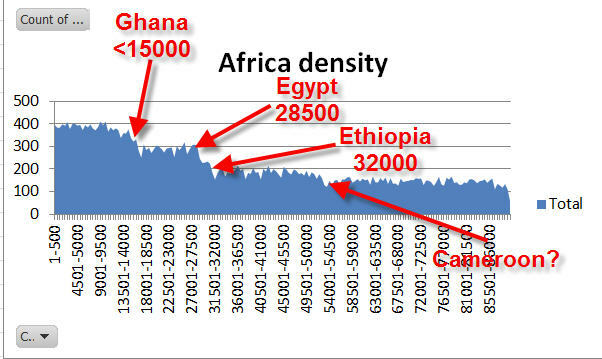 If we look at the density charts for the three large regions we can almost pinpoint the cutoff points for these countries. I have increased the detail of the grouping in a couple of cases to make things clearer. Remember these are where the countries hit their limits during the draw process – the VB limits for these countries could be lower. 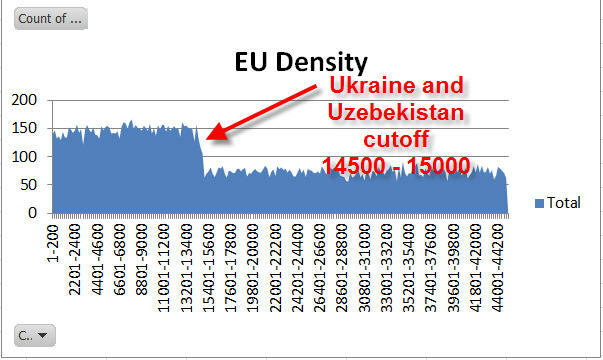 It is hard to know which country is which in EU – one cuts off just below 14500 and the other at about 15000. For Africa there are 3 certain cutoffs as shown above (Ghana is more like 16XXX) and a possible cutoff for another country which I suspect might be Cameroon (it could also be Liberia or DR Congo). This suspected cutoff happens around 53k and the reason I did not know about it before is because I don’t have the entrant numbers for DV2014 and DV2015 (only 2013 and before). That would indicate a sudden increase in the entries for one of the countries (Cameroon, Liberia or DRC) – possibly because of agents operating in that area. Just a quick note about the cutoffs. IN each year there seem to be a handful of cases that are “outliers” – a country is limited but you find one or two cases way outside the normal cutoff. Those cases can sometime be explained (as someone who is charging to a non limited country) BUT there have been a couple of cases that were unexplained. That doesn’t ruin the theory – it simple shows the limiting process is not perfect. There are no limited countries in these two regions. As I have explained in this post before the exclusion of Nigeria has affected the case numbers. 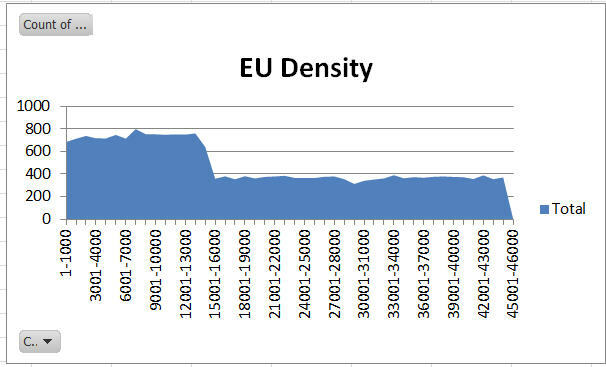 Before seeing the CEAC data I could not be sure how big was that impact, but the impact is more clear now. The highest AF case in the file is 89799. There is a chance they have cut that off slightly early – but given the number of cases for AF region is 39.2k, I actually think we have pretty much every case (let me know if you feel differently). DV2014 has case numbers as high as 116k. 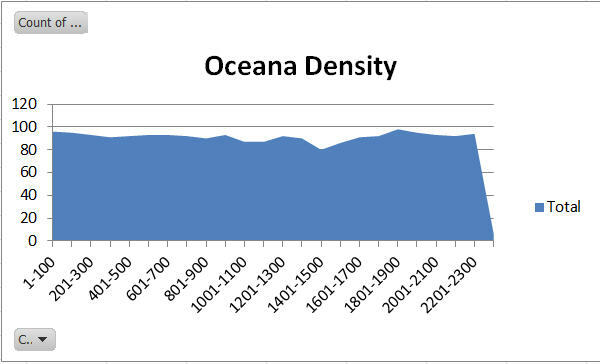 So – there has been a 26k plus reduction in case number – or increase in density. As I mentioned in the earlier post this means that a medium high case number for DV2015 is not as low as it was in DV2014 – so the AF max case number in DV2015 will not reach as high as the 81100 we saw in DV2014. I am not certain where the axe will fall and the DS260 change could have an impact, but it seems sensible to consider that cases above 70k are in a risky range. OK – this is hard to be accurate this early in the year, but the completeness of the data makes things a little easier. The DS260 fiasco would certainly have had an impact, but as yet is isn’t clear what impact that could be. The quotas will have been increased as explained in this post. Local political turmoil, Ebola, and the ability to resolve AP cases will all have an impact, but that being said – let me make some rough guesses in the areas where my understanding has changed based on seeing the data. I expect a final cutoff around 68XXX to 74XXX. This far out that is as close as I can get – so don’t bet the farm on these numbers – I would not give up at this point, but at least higher numbers can get their backup plans in place. We know a heck of a lot now but most crucially we do not know the “non response” rate – the number of people that won’t even return their forms. That rate is significant – especially ion this year with the DS260 introduction. Of the countries that experience a slowdown during VB progression, I expect all Ethiopian selectees to go current and almost all Egypt selectees (there might be a small cutoff in place at the end of the year for Egypt at around 27500). I think Asia will be largely a repeat of last year. However, that assumes Iranian AP cases are held back again as we saw in DV2014. If those cases are resolved faster (not very likely in my opinion) than last year the AS final number could be smaller than last year. 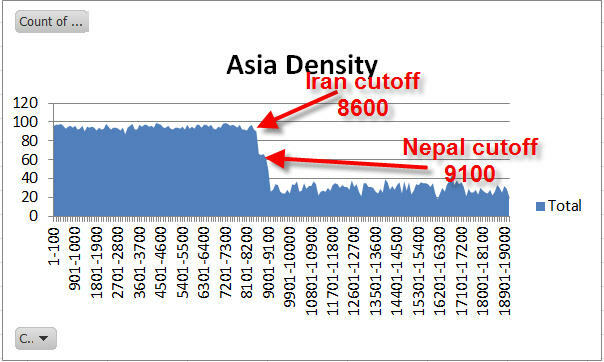 Nepal and Iran could be limited – and I see Nepal hitting the limit again this year perhaps being limited in the 8600 to 8800 range (compared to the 9500 limit in place at the end of last year). So – Asia should reach around 13XXX if Iran behaves the same way or as low as 11XXX if Iran AP cases resolve faster. I was very surprised to see the 45k high case number. It almost feels like a “mistake” – but if true it represents an increase in density (probably due to agents in Ukraine and Uzbekistan). Up to now I have been assuming that the quota increase for EU would mean a slight increase in the final case number above last year (40150). However, given the density and lower max case number I now feel that we might fall a bit short of the 40k mark. So – I would guess a final number in the 38XXX to 41XXX range (allowing for a margin of error). There were no big surprises in the CEAC data for these two regions so my estimates are unchanged (OC 16XX to 17XX and SA around the same as later year). Final comments about case number predictions. I am very aware of how important the DV lottery is to people. I am not looking to cause anyone to lose hope – I am simply trying to offer informed opinion. I could certainly be wrong and I would be delighted to see numbers go higher than the amounts I have said. I remain utterly supportive of all selectees, whatever your case number so if you have a high number and want to ignore my predictions I will totally understand that and will happily help in any way that I can. good aftroon please tell we get svere pain africa af70000 up to less than 74000 asigned plan B IS 100% SURE i will give some dolar for you . tell me exacly cut of am sure you know every thing please i will help you tell me but KCC TOLD ME SHOUD WAIT THE ANSER EVEN NOW AM PHONE A TELEPHONE ALWAYS .BUT YOU KNOW MORE THAN FINAL CUT OF THIS YEAR . I do not know the exact final cutoff. That is impossible for ANYONE to know with certainty. Hi Britsimon, I am from Nepal and my case number is in the upper 7100’s ..After the recent visa bulletin ranked a lower case Number for Nepal..I am really unsure of my chances for Green Card. Do you think I still stand a chance? *really worried. There is still some small chance. Wait and see…..
I’m not sure Edouard. I have always thought the number was risky, but the last few thousand case numbers contain so few actual cases that it is hard to be precise. Some, (including some very smart statisticians) see your number as “In with a chance”. I suspect we won’t really know for sure until the August VB (released in July). Hi Simon, My case number is 2016AF49000 ******** From Ivory coast. have i any chance? Yes I think so – but we will know more about numbers in a few months. Hey BritSimon, I’m from Cameroon. My CN is 2015AF 684**, do u think I stand the chance? If yes, when can the interview be? Thank u. DID you finallly Get a reply Hope , am from cameroon too? third week in JUne roughly. Thanks my dear for every thing you did. what i want to as you my status in KCC it says ready for interview in August according to case AF 41xxxxx but not yet updated in the check web site. So what i can do may i mail to KCC to know my interview date becouse when the 2LS is released they give for preparation 6 weeks or beyond that. Let you advice me what to do possible actions. You have been scheduled for an August interview. You can do one of these two things. 2. Call KCC and they will tell you the date. In either case you should be preparing documents and booking the medical knowing that your interview is coming very soon. I HAVE BEEN IN RELATIONSHIP WITH MY GIRL FROM LIBERIA FOR 5YRS NOW. SHE STAYS IN LIBERIA AND I AM A US CITIZEN. I WANT TO SEND FOR HER BUT WE DONT HAVE A PROVE OF PIC TOGETHER, BECAUSE I LEFT LIBERIA FOR LONG AND WE WERE LOVING BUT DUE TO THE EBOLA CRISIS, SHE LOST THE PICS WE HAD TOGETHER. BUT SHE GOT SOME MONEY TRANSFER DOC AND I AM GOING TO GET A GOOD AFFIDAFIT AND OTHERS DOC IN SENDING FOR HER. WHAT IS MY CHANCE IN GETING THE K-1 VISA / FIANCE VISA? I have no idea about K1 visas. I’m in the Oceania region and my case number is 1273, do you think I’m still a chance with 2 months to go? I’m a little concerned as previous years it’s been around 1400-1600 by July. And I’m just worried with 2 months to go they’ll stop the cut off and I’ll miss out by 23? YOu will be fine – I expect you will be current in a few days. 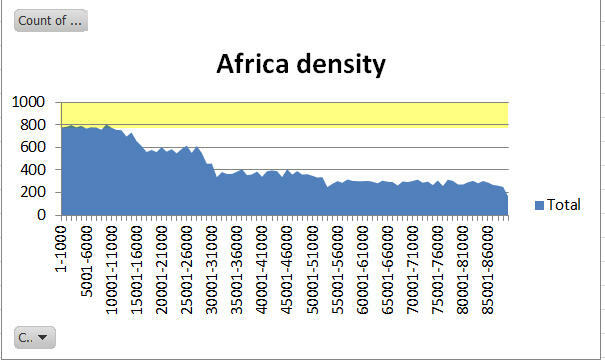 hi brit simon yu are great analysis my casenumber is africa71050. so as good analysis give some advice about this case becouse urgently i want leave waiting so iam decide plan B FROM THI MONTHES what do you thin k on your opnening please advice me urgently the correct way .becouse you are father of good analysis. am waiting your anser politly. HI SIR,MY CASE NUMBER IS 82,530 FROM LIBERIA, AFRICA DO I HAVE ANY CHANCE OF BEING SELECTED FOR AN INTERVIEW? Sadly no, your number is too high. Your case number is unlikely to be reached. So – you will obviously watch with interest, but once the VB in July comes out you will know for sure. Logically or mathematically your density chart is not correct , because the some of 600 and 600 for Africa and Europe exceed 1000 case , like you say on the first 1000 dv case there is 600 from Africa and 600 from Europe . OK – the data is not wrong – it is your understanding that is wrong. The regions are in their own number ranges, not combined. The highest case number is 89799. However, within that range there are 39266 cases. The 60000 are attached to those 39266 cases (more than one person per case obviously). Please try and understand what you are reading rather than saying x or y is not correct. 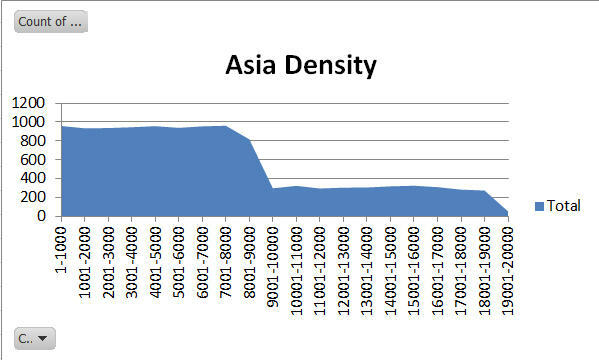 Your density chart mathematically wrong . Possibly yes – it was produced 6 months ago with data we had never seen before. What do you think is wrong? Looks ok to me – but I will try a different PC. Thanks. You are reading an article that is over 6 months old. Since it was published we have seen a been a lot more data including an very large increase in the derivative rate (selectees getting married, having babies and so on). Largely because of that the earlier estimates are no longer accurate. Sadly I do not now think we will see your number going current. hi brit so my case number is no chance for interviw so wtat can you advice for selectee 2016 dvlotery what criteria can use for the next inorder to selectee give some advice. The lottery is random. There is no criteria or method to increase your chances. I have 2015AF 646xx and thinking as to whether KCC will reach my case.Can u say something in this regards. I case number is 2015AF00064606 but haven’t receive my interview date yet.When I last check VB,I saw that the latest update is 50,000.Do I stand a chance of getting an interview date? Sadly no, there is no chance – the latest update to 50,000 is the LAST update for DV2015. The next VB is the start of DV2016. Sadly I don’t think you will get an interview. Since I wrote the above article, much has happened and my gut feeling is lower now – much lower. You will see the final VB in 3 weeks time – and then we will be sure…. I am from Nepal.I always check your blog. I am feeling hopeless that my case no. AS7750 & last cut off nepal will hit this case no. or not. Is there any chance to get 2nd letter for me. The truth is, you will only know for sure when the VB is released. However, I have said before, I think the VB will cut off before your number is reached. So 50k is it for Africa for the DV- 2015. Other options are through work based immigration or family based. But I don’t know much about those routes. hi brit how you my case number is 2015af71050 stil in further in prococessing so what is mean . no any information from KCC IN MY EMAIL. so what do you think. I’m sorry but your number is too high – the final cut off is at 50,000 – so your number will never be current. Try entering again in DV2017. my case is 2915AF00079***. When should i expect a notification about my interview? thanks for your analysis. i just want to know after sending your ds260 form if they say submitted but unclassified. at the top of your application what does it refer to?. Thanks for the updates and the work so far. For Liberia, many of the applicants aren’t appearing or showing up during interview date simply because they lack one or more requirements. In this case, can you say something to applicants between 51,000 to 65,0000. Is there hope for them? No there is no way to extend the max number now. What is the max number now? Hi Simon. Now that i got my Visa I am required to have travelled by the 5th of January. Wanted to ask if it is allowed that i travel first maybe in a month time and my wife and kid can follow maybe after Xmas or sometime before?. Do we have to enter America together since I am the principal? Thanks in advance. The principal can enter with or before the derivatives. The derivatives cannot enter before the principal. i am a winner from Africa AF62>>> Based on ur suggestions it appears as if i still hav hopes. pls clearify me. DV2015 has ended at 50,000. If your case is higher than that (and DV2015) then no you have no hope. I am a DV 2015 winner and went for interview on the 16th of September 2015 with my wife and step daughter. All of my documents was correct and was denied because of low affidavit. My consular ask me to do a joint affidavit and send it to the embassy. Please advice me on this. Get another affidavit from someone who has enough income. You have very little time – so get on with it. Can you comment on your May analysis from the height of September 2015? Were they correct? Were they incorrect? I am particularly interested in whether you classified each the spikes correctly, belonging to Ukraine, Uzbekistan, Iran, Nepal, Egypt, Ethiopia, Ghana, Cameroon? What were the correct numbers for Ukraine and Uzbekistan? Or were there any errors? They were in the ballpark – but I haven’t gone back to check them. We can’t check them precisely because the CEAC data is by embassy, not by country of chargeability. You can get pretty accurate numbers by calculating starting derivative rates from the entries, working back from the selectees to get cases, then using regional entry numbers to obtain the winning chances of selectees. The limited countries because obvious and you can predict where the country cutoffs should be and match to the hole increases we see in the CEAC data. All of that data is publicly available. Hi, I am a DV selectee for the DV-2016 program… My Case Number is 2016AS00009XXX… I don’t know how to read the visa bulletin, so can you please guide me on how likely it seems that I will be called for an interview? I submitted my DS-260 form on the 11th of May 2015. I’m a winner of DV 2016 with cn 554x, could you please help me suggest if I would get 2NL and probably when. Hi Brit, I’m sorry for not mentioning region, I’m from Nepal, a DV selectee of 2016 with cn 554x. I submitted my DS 260 on 6 July 2015, is there any chances for second letter ? Pliz share your views. So there is some chance – but we don’t have enough data to be certain. You will have to wait until June/July to know your fate. I really like your analysis. Could you please predict interview the time for case number 65XX for Nepal for 2016. Thank you. No. I don’t have data yet – and even with data I cannot be precise that far out. What is the chances of 65XX case number for Nepal in 2016. NO. I have not understood what you mean. Could you please explain me little bit more on what would the case of 65xx case number for 2016 in the case of Nepal. As I already said – I cannot predict that. HELLO BRIT, HOW ARE YOU DOING? HOPE FINE.BRIT I MADE AN ENQUIRY WITH REGARDS TO MY VISA APPLICATION STATUS AND KCC SENT ME A MAIL AS SHOWN BELOW. Your case number is now current for interview processing. Once the interview date has been scheduled, you will receive notification via email to check http://www.dvlottery.state.gov. If you need to make changes to your DS-260 you should contact the consular section where you will be interviewed, or bring the information about your changes to your interview appointment. Because your case is ready to be scheduled, KCC can no longer unlock your application. 2.SHOULD I EXPECT 2NL DIS MONTH? 3.I SUBMITTED MY DS 260 FORM ON THE 18TH AUGUST WITH CASE NUMBER AF9104 .AM I CURRENT FOR FEBRUARY INTERVIEW? HELLO JAD THANKS FOR THE RESPONSE .ARE YOU FROM AFRICA?IF YES WHAT COUNTRY?I AM FROM SIERRA LEONE. It means they are scheduling your interview at this time – you WILL get a February interview. In DS 260 registration form there was a question/column to be filled in either ‘YES or ‘NO’ (regarding my previous job as a school teacher) i,e -Do you need 2yrs or more training for this job ?’. The appropriate answer in my case I suppose should be ‘NO’ , but I filled ‘YES’. I’m worried. Please share your views if there could be any problem in case I get 2NL for AS 554X (Nepal) . That is trivial, don’t worry about it. I’m sorry for troubling you, thank you Sir. The DS260 has been taking around 3 months to process. You can email KCC to unlock and correct the mistakes – and you have time to do so. As per your suggestion, I asked my spouse (as I’m out of Nepal ) to go to my agent / consultancy to help her to inquire- to unlock and make necessary corrections of my mistakes in DS 260. But, they suggested her that one could unlock and correct DS 260 even after we get 2NL, BUT BEFORE INTERVIEW . 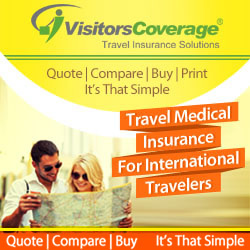 They even gave the links (support-nepal @ ustraveldocs.com / consktm.state.gov). I read it and found exactly the same here too. But your version, “DS 260 remains locked after 2NL until interview ” (from your comments) makes me completely confuse . Do you mean we can’t unlock DS 260 for correction after we get 2NL ? Please help me to understand. Please spare few minutes for me to go to the above given link and suggest what I should do now . 2. If it’s possible to unlock after getting 2NL, will they delay the interview ? 3.Which link / address should I go to unlock my DS 260 ? You can’t unlock the DS260 after 2NL (that is the statement from KCC). To unlock you email KCC. My case number is 2017AS000017## when I expect the interview and am I safe ? I already read that link but still I don’t have a clear idea about when can I expect the interview I already finished the DS-260 but due to the long distance between me and the embassy I need to have a guess at least to be ready this is why I asked you. You get 6 to 8 weeks notice of the interview. sorry for asking too much. DV2014 and DV2015 and DV2016?